Give in to your Camry desires. The all-new 2019 Toyota Camry is a joyride for the senses. The redesigned exterior is enhanced by a sleek, flowing shape. It’s an evocative look that’s less subtle and more seductive. XSE and SE models push the limits of the new, wider stance with unique catamaran-inspired accents and a black sport mesh grille that demand to be seen. Sporty yet elegant front and rear bumpers set your heart racing, while standard Toyota Safety Sense™ P (TSS-P) helps provide peace of mind. Camry has undergone a total transformation, from a proven sedan to one that pushes the limits. Now you can go more places in complete confidence — and always arrive fashionably great. All new Toyota Camry models include the features shown below. Additional equipment and option upgrades are available. If you need specific answers about Toyota Camry Trim Packages, Upgrade Options or Available Inventory, please Contact Us today. 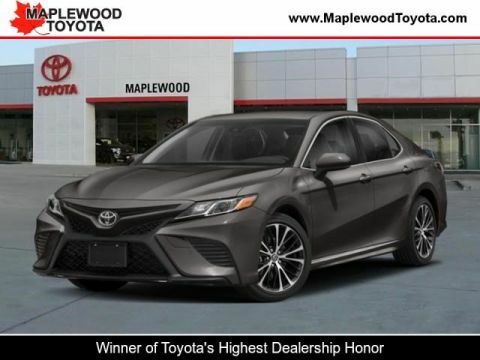 Get $750 Cash Back on a new 2019 Toyota Camry. Other Toyota finance rates are available. (See disclaimer for details.) 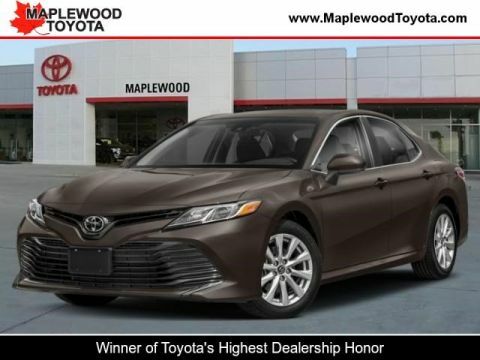 Talk to Maplewood Toyota about all your Toyota Camry finance options. Get $750 Cash Back on a new 2019 Camry. Offer ends 04-30-2019, cannot be combined and is subject to availability. Cash back from Toyota Motor Sales USA, Inc. Varies by region. See participating dealer for details. Does not include College Grad or Military Rebate. ToyotaCare covers normal factory scheduled service for 2 years or 25,000 miles, whichever comes first. Offer valid in Illinois, Indiana, Minnesota, and Wisconsin. See Toyota dealer for details and exclusions. Plus $100 Maplewood Toyota Dealer documentation fee. 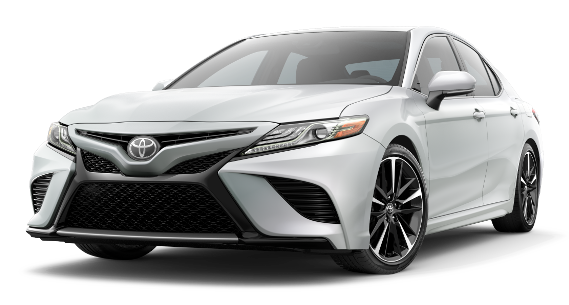 Get a new 2019 Toyota Camry leasing for only $229 per month for 36 months. (See disclaimer for details.) 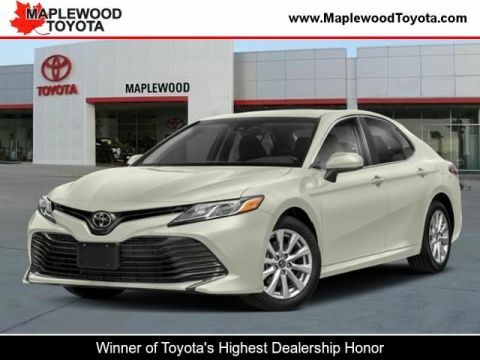 For great Camry leases, Maplewood Toyota is your place to be. 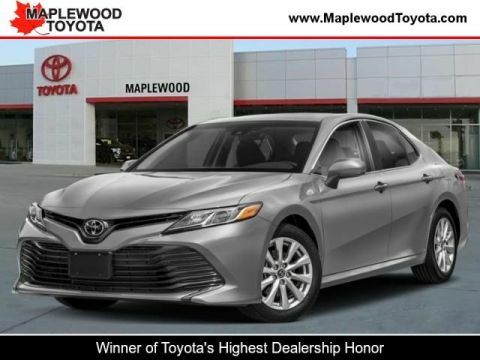 Lease a new 2019 Camry for only $229 per month for 36 months.Lease a new 2019 Camry (2.5L 4-Cyl Gas Camry) for $229 a month for 36 months with $2699 due at signing, which includes first month's payment, $1820 down payment, $0 security deposit and $650 acquisition fee. Does not include, taxes, license, title fees, insurance and dealer charges. Closed-end lease. Example based on model #2532 with FE, 2T. Total Manufacturer’s Suggested Retail Price $25554. Monthly payments of $229 total $8,244. Capitalized cost of $22056 based on down payment and dealer participation, which may vary by dealer. Payment may vary depending on model, equipment choice, and final transaction price. Lease-end purchase option is $14310. Customer responsible for maintenance, excess wear and tear and $0.15 per mile over 12000 miles per year. To qualified Tier 1+ customers through Toyota Financial Services. $350 disposition fee due at lease end unless customer purchases vehicle or decides to re-finance through Toyota Financial Services. Subject to availability. See participating dealer for details. Offer ends 04-30-2019. Does not include College Grad or Military Rebate. ToyotaCare covers normal factory scheduled service for 2 years or 25,000 miles, whichever comes first. Offer valid in Illinois, Indiana, Minnesota, and Wisconsin. See Toyota dealer for details and exclusions. Plus $100 Maplewood Toyota Dealer documentation fee. 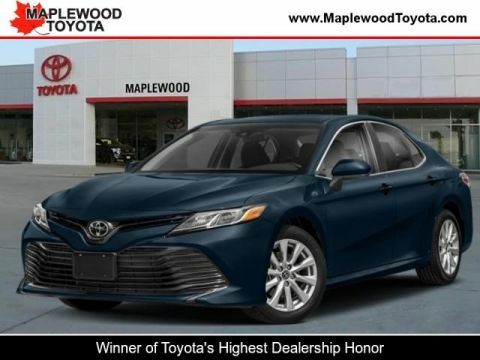 Get a new 2019 Toyota Camry financed at 1.9% APR for 60 months. Other Toyota finance rates are available. (See disclaimer for details.) Talk to Maplewood Toyota about all your Toyota Camry finance options. Get 1.9% APR for 60 months on a new 2019 Camry. 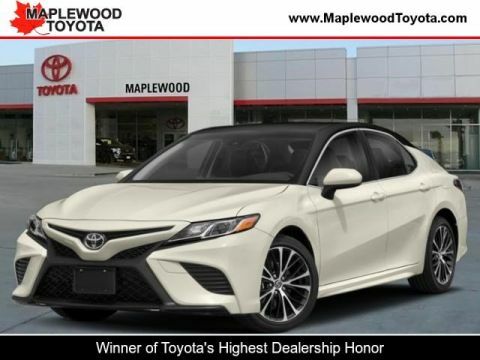 1.9% Annual Percentage Rates (APR) for 36 months, 1.9% APR for 48 months, 1.9% APR for 60, 3.9% APR for 72 months available to eligible customers who finance a new, unused, or unlicensed 2019 Camry from Toyota Motor Sales, USA, Inc. (TMS) and Toyota Financial Services (TFS). Offer valid 04-02-2019 through 04-30-2019. Specific vehicles are subject to availability. You must take retail delivery from dealer stock. Special APR may not be combined with any other Customer Cash Rebates, Bonus Cash Rebates, or Lease Offers. Finance programs available on credit approval. Not all buyers will qualify for financing from Toyota Financial Services through participating dealers. Monthly payment for every $1,000 financed is 1.9% - 36 months = $28.60; 1.9% - 48 months = $21.65; 1.9% - 60 months = $17.48; 3.9% - 72 months = $15.60. Bonus cash from Toyota Financial Services on TFS lease contracts only. Must be applied to the transaction. No cash payment will be made to consumer. Offer valid in Illinois, Indiana, Minnesota, and Wisconsin. See your Toyota dealer for actual pricing, annual percentage rate (APR), monthly payment, and other terms and special offers. Pricing and terms of any finance or lease transaction will be agreed upon by you and your dealer. Special offers are subject to change or termination at any time. Offer ends 04-30-2019. Plus $100 Maplewood Toyota Dealer documentation fee. Have you driven the new Toyota Camry yet? 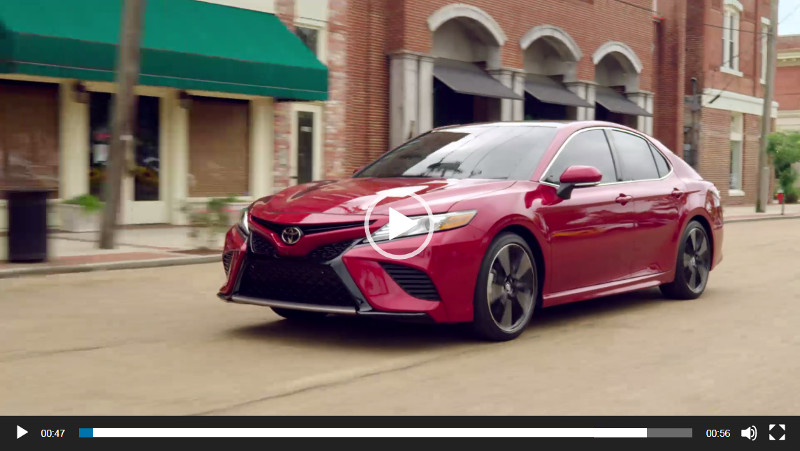 Check out this Camry Video Overview showing video of on-the-road, exterior and interior shots. Entune™ 3.0 Audio Plus with JBL® w/Clari-Fi and App Suite includes:includes nine speakers including subwoofer amplifier, 8-in. touch-screen, AM/FM/HD Radio,™ CD player, auxiliary port, USB media port, two USB charge ports, advanced voice recognition, hands-free phone capability and music streaming via Bluetooth® wireless technology, Scout® GPS Link compatible with up to 3-year trial, Siri® Eyes Free, Apple CarPlay® compatible, SiriusXM® Satellite Radio with 3-month All Access trial, Entune™ 3.0 Toyota Connected Services — Safety Connect® with 3-year trial, Service Connect with 3-year trial, Remote Connect with 6-month trial, Wi-Fi Connect Powered by Verizon with up to 2GB within 6-month trial. See toyota.com/entune for details. Entune™ 3.0 Audio Plus with JBL® w/Clari-Fi,™ App Suite — includes nine speakers including subwoofer amplifier, 8-in. touch-screen, AM/FM/HD Radio,™ CD player, auxiliary port, USB media port, two USB charge ports, advanced voice recognition, hands-free phone capability and music streaming via Bluetooth® wireless technology, Scout® GPS Link compatible with up to 3-year trial, Siri® Eyes Free, Apple CarPlay® compatible, SiriusXM® Satellite Radio with 3-month All Access trial. Entune™ 3.0 Toyota Connected Services — Safety Connect® with 3-year trial, Service Connect with 3-year trial, Remote Connect with 6-month trial, Wi-Fi Connect Powered by Verizon with up to 2GB within 6-month trial. See toyota.com/entune for details. Camry XSE’s powerful shape and captivating style will announce your arrival—with authority. The muscular shape is defined by a pleasing mix of sweeping curves and chiseled surfaces. Sport side rocker panels and the integrated rear spoiler emphasize the coiled stance and redirect airflow to enhance efficiency and performance. It’s an irresistible symphony of flowing lines and sharp, unconstrained edges that always makes an impact. Let the aggressive lines of the available gloss-black grille draw you in. The available sport mesh insert projects a finely machined appearance. It’s just one of many exquisite details found on Camry. The available dual exhaust with quad chrome tips dishes out a powerful look, matched only by the sporty sound. It’s sure to leave a lasting impression. 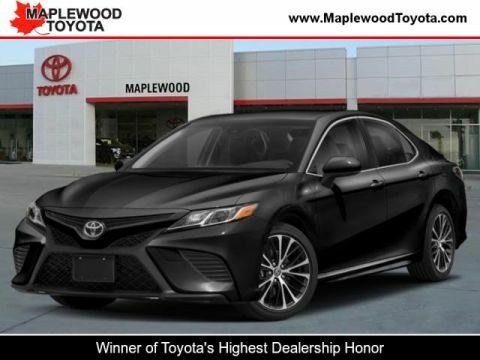 Add to the allure with the lustrous black hue found on Camry’s available 19-in. alloy wheels. The deep color dramatically contrasts the exquisite machined finish of the V-shaped spokes. Low-profile 40-series tires complete the distinctive look while providing a precise, confidence-inspiring drive. More efficient and powerful standard Bi-LED combination headlights add a stylish touch, stretching outwardly from the thin upper grille. The XSE’s LED headlights with smoke tint and fully integrated LED Daytime Running Lights (DRL) add an illuminating touch to this expressive look with an inspired symmetrical design. Camry’s available LED taillights feature an eye-catching organic shape. It’s a powerful look that flows seamlessly into the rear bumper. Stylish lights like these are the perfect way to brighten any drive. When the drive takes a spirited turn, Camry’s available steering wheel-mounted paddle shifters give you the power to shift gears manually for a more controlled experience. It makes extremely fast shifts possible with a precise, responsive feel. Camry’s redesigned seats are distinctively shaped with available leather trim and contrast stitching. Such finely crafted details ensure your style never takes a back seat. Take Camry’s sporty look to the next level with XSE’s available color-contrasting black roof, side mirrors and rear spoiler. The distinctive two-tone Midnight Black Metallic roof1 highlights the stylish rear roof pillars and adds to the presence of the lower, wider stance. Camry offers a choice of gasoline engines, the all-new 2.5-liter Dynamic Force 4-cylinder and a new 3.5-liter V6, each delivering a sophisticated blend of performance and efficiency. Both engines utilize the D-4S direct-injection system, which selects the optimal injection method based on driving conditions to pack a powerful punch with enhanced fuel efficiency to boot. It proves the rational choice can also be an exciting one. Enjoy the perfect harmony of a drive that’s both relaxed and confident, thanks to Camry’s MacPherson strut front suspension and new double-wishbone rear suspension. They deliver a smooth ride and sharp handling so you can take on any trip from crosstown to cross-country. Camry’s newly developed Direct Shift 8-Speed Automatic Transmission improves acceleration from a stop, provides a smooth ride at highway speeds and enhances fuel efficiency. More control makes for a more thrilling drive. Three distinct available drive modes give you even more control. Sport Mode indulges your spirited side with a sharper acceleration feel, while ECO Mode adjusts throttle input to maximize your efficiency. Normal Mode blends fuel economy with performance. Thanks to this choice of drive modes, a perfectly tailored drive arrives with the push of a button. Camry reaches new levels of performance and efficiency. With up to an EPA-estimated 41 highway mpg,1 it’s the best of both worlds. It’s a space that’s all about you, with an inviting, wide-open sensation. Get behind the wheel and the driver-centric position envelops you with an intuitive feeling. Thanks to the perfectly placed steering wheel controls, everything you need is right at your fingertips. Camry offers an available 8-in. multimedia touch-screen with intuitive pinch-and-zoom navigation controls for a familiar experience. The new Entune™ 3.01 system speaks to your style with a customizable home screen and standard Entune™ 3.0 App Suite2 with available Toyota Connected Services. You’ll even welcome the longest trips thanks to the Scout® GPS Link App3 with moving maps and available 9-speaker, 800-watt Entune™ 3.0 Premium Audio with JBL® w/Clari-Fi. The available 10-in. color Head-Up Display (HUD) projects important info, such as your speed, turn-by-turn directions, and more, right onto the lower portion of the windshield. It helps you stay focused on the road ahead. The available 7-in. color Multi-Information Display (MID) presents turn-by-turn directions, safety info and alerts right where you need them. 1 Apps/services vary by phone/carrier; functionality depends on many factors. Select apps use large amounts of data; you are responsible for charges. Apps and services subject to change. See toyota.com/entune for details.2 Be sure to obey traffic regulations and maintain awareness of road and traffic conditions at all times. Apps/services vary by phone/carrier; functionality depends on many factors. Select apps use large amounts of data; you are responsible for charges. Apps and services subject to change. See toyota.com/entune for details. 3Be sure to obey traffic regulations and maintain awareness of road and traffic conditions at all times. Apps/services vary by phone/carrier; functionality depends on many factors. Select apps use large amounts of data; you are responsible for charges. Apps and services subject to change. Availability and accuracy of the information provided by Scout® GPS Link is dependent upon many factors. Use common sense when relying on information provided. Services and programming subject to change. Services not available in every city or roadway. See toyota.com/entune for details. Scout® is a registered trademark of Telenav, Inc.
Camry’s available Bird’s Eye View Camera1 with Perimeter Scan uses front-, side- and rear-mounted cameras to display a panoramic overhead view. It helps you get in and out of the tightest spots with confidence. See more of what matters, thanks to Camry’s available Intelligent Clearance Sonar (ICS)2 with Rear Cross-Traffic Braking (RCTB).3 This warns you when it detects nearby obstacles and, if necessary, under certain conditions will reduce engine power and apply the brakes. Never miss a connection with Camry’s available Wi-Fi Connect Powered by Verizon.4 The Toyota-first system supports up to five devices, making Camry the hottest spot on the road. Add available Qi-compatible wireless smartphone charging5 and leave your wires and worries behind. Even if your Camry is out of sight, you can stay connected with available Remote Connect.6 It helps you remotely monitor guest drivers, control interior temps and locate your Camry in a crowded lot. 1 The Bird’s-Eye-View Camera does not provide a comprehensive view of the area surrounding the vehicle. You should also look around outside your vehicle and use your mirrors to confirm surrounding clearance. Environmental conditions may limit effectiveness and view may become obscured. See Owner’s Manual for additional limitations and details.2 Intelligent Clearance Sonar (ICS) is designed to assist drivers in avoiding potential collisions at speeds of 9 mph or less. Certain vehicle and environmental factors, including an object’s shape and composition, may affect the ability of the ICS to detect it. Always look around outside the vehicle and use mirrors to confirm clearance. See Owner’s Manual for additional limitations and details. 3 Do not rely exclusively on the Rear Cross-Traffic Braking system. Always look over your shoulder and use your mirrors to confirm rear clearance. There are limitations to the function, detection, range and braking performance of the system. See Owner’s Manual for additional limitations and details. 5 Qi wireless charging may not be compatible with all mobile phones, MP3/WMA players and like models. When using the wireless charging system, avoid placing metal objects between the wireless charger and the mobile device when charging is active. Doing so may cause metal objects to become hot and could cause burns. 6 Use only if aware of circumstances surrounding vehicle and it is legal and safe to do so (e.g., car uncovered in open area, no people or pets in or nearby). If vehicle has not been driven for a week, services will not be available until next time vehicle is started. Functionality depends on many factors, such as vehicle and smartphone connectivity. Registration and app download are required. Must have an active Service Connect subscription. Subscription purchase required after 6-month trial. See usage precautions, service limitations and Owner’s Manual for details.